It was a Memorial Day to remember at Chase Field on Monday, as pregame festivities honored military veterans and those currently serving in the armed forces. The D-backs then made the night exciting with yet another impressive performance on the diamond. Behind a 19-hit, 15-run offensive explosion, the D-backs won their seventh straight game, and remain in first place atop the National League West. Monday night’s win was also the team’s seventh straight home victory. The D-backs blasted five home runs in the game, had six hits in the third inning, and scored four runs or more in three different innings. It was the sixth game this season in which the D-backs scored ten runs or more. There plenty of offense from everyone in the D-backs lineup on Monday night. But it was Upton and Kelly Johnson who stole the show. Upton collected five hits in the game, tying a career high. He started things off by lacing a double to center field in his first inning at-bat. Two innings later, he drove a two-out single to left field. Upton later scored on Chris Young’s infield single. The fourth frame saw Upton hit a soft single into right-center that allowed Gerardo Parra to score. Upton’s fourth hit of the evening came in the sixth when he knocked another single to left. Upton saved his loudest and farthest hit for the seventh inning, when he stepped up to the plate against Florida pitcher Mike Dunn. Upton crushed a 0-1 pitch into Friday’s Front Row in deep left field for his 10th home run of the season. Johnson’s four extra base hits tied a franchise single-game record, the eighth time it has happened. He also became the second Major League player this season to reel in four extra base hits in a game. In the leadoff spot, Johnson launched home runs in both the third and sixth innings for the seventh two-homer game of his career. He last did it on April 23, 2010. The hard-hitting lefty rocketed a double in his fourth inning at-bat, and legged out a triple in the seventh. In May, the D-backs own a 19-9 record. They are also 17-11 this season against teams with winning records. The D-backs’ recent success has vaulted them to the top of the NL West. By posting a 6-1 record on the recent road trip, the D-backs overtook the Giants for first place. 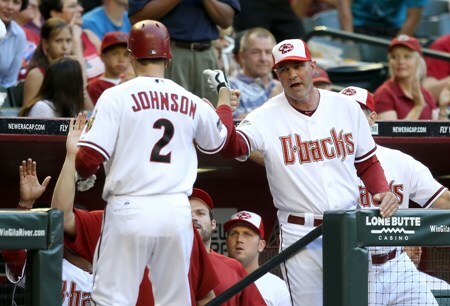 Although Gibson is pleased with his team’s winning ways, he’s adamant that the D-backs must stay focused.